In this post I am showing you combination of lemon juice, pomegranate juice and potato juice to make ice cubes. These cubes help to rejuvenate your skin and remove every type of dark spots. All ingredients using in this recipe helps to protect your skin naturally. Let see the amazing recipe here. First take a potato and peel it off then grate it using a grater. Now add this grated potato in a blender and add half bowl of pomegranate seeds and one tbsp of water in it. Blend this mixture to make it juice and add half lemon juice in it. Mix it and pour this mixture in each section of ice tray. Place the ice tray in a freezer at least 6 - 7 hours. When the mixture is in frozen, your ice cubes are ready to use. 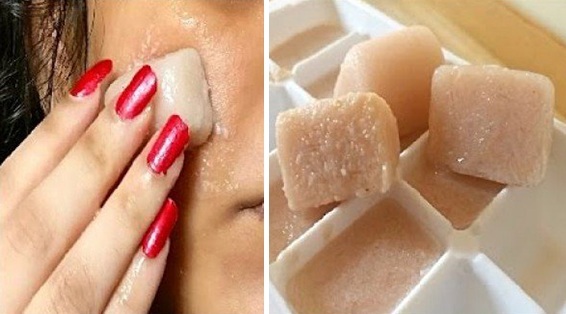 Now take an ice cube and directly rub it on your dark spots. Rub this cube for few minutes, and then wash your skin with cold water. Daily rub 1 or 2 ice cubes for best result.